From grilled cheese to cocktails, drag queen and leggings, the French-language watchdog in the Canadian province of Quebec has relaxed its guidelines around some common "anglicisms". It's the Canadian province that made international headlines for "pastagate" - a fracas over the use of the word "pasta" on an Italian restaurant's menu in Montreal. So it comes as no surprise that new guidelines from Quebec's French-language watchdog on some common, longstanding "anglicisms" has sparked debate. The use of a handful of English words whose Francophone equivalents have never been adopted by Quebecers are now considered acceptable infringements on French in the province. Grilled cheese is as OK as "sandwich au fromage fondant", cocktail instead of "coquetel" gets a pass, baby-boom can be used instead of "bébé-boum" and softball is fine in place of "balle-molle". A handful of words from languages other than English - café latté, gelato, scampi - are also now considered permissible in French in Quebec. The 51-year-old language watchdog agency - the Office quebecois de la langue francaise, known as OQLF - quietly adopted the changes earlier this year. OQFL spokesman Jean-Pierre Le Blanc says the policy was loosened "to keep in the mind the social and linguistic reality of Quebecers". "We're legitimising what is already commonly being used," he says. Le Blanc says that the agency will continue to promote French and propose equivalents as new words like hashtag ("mot-clic") come into use. Image caption Cocktail or coquetel? Some like "divulgâcheur" as a replacement for spoiler, or "cuisinomane" for foodie, appear unlikely enter into daily conversation. But "courriel" for email, or "égoportrait" for selfie, have caught on. Le Blanc says they demonstrate that "French can also be creative, can describe situations that are new, that are modern". "But we're not closed to other languages. That's what we want to show with this new policy." The language agency was established in 1961 with the mandate to defend the use of French in Quebec as well as fight English words being borrowed and creeping into the common vernacular. Language has always been a thorny issue in the predominantly French-speaking province. One former researcher at the OQLF was so incensed by the change he said the agency was abandoning its responsibilities and participating in "voluntary subjugation". But Benoît Melançon, a French literature professor at the Université de Montréal, says the OQFL is simply being "realistic" with the updated policy. "No one in Quebec says 'coup d'écrasement au tennis' instead of saying 'smash'. It doesn't exist," he says. "If you propose it and after 10, 15 years no one is using it, you can't be stubborn about it." The French-language watchdog has a reputation for stringent application of the Quebec's language laws. It has found itself at odds with angry restaurateurs, business owners, and large retailers over the application of the provincial language laws. The new guidelines mean that some restaurants that have had run-ins with the OQLF are now in the clear. In 2016, a restaurant called La Mama Grilled Cheese in Quebec City received a letter from the language agency for its now justified use of "grilled cheese". 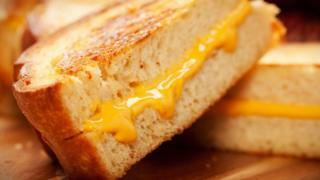 Le Cheese restaurant, a gourmet grilled cheese establishment in Montreal, has also faced concerns over its name. Owner Pascal Salzman told the CBC "I'm all for preserving the French language and culture - I think it's a great initiative - however, I don't think using the word 'grilled cheese' is going to destroy that heritage."